What is it about ZJ manufacturing that makes us great? We continually strive to make the highest quality stabilizer weights on the market and deliver them to you in a timely manner. We saw the opportunity and followed our passion to bring our customers the quality parts they deserve. 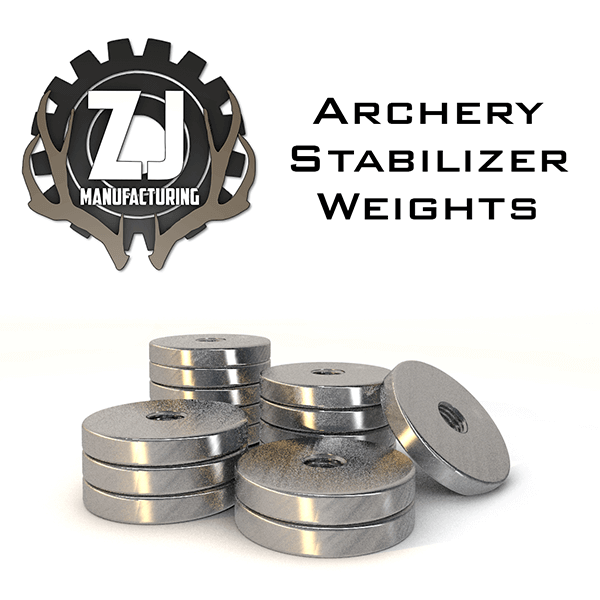 Within the next couple months we will start selling our archery stabilizer weights directly on our website and will soon broaden our scope into a vast range of stabilizer components. A stabilizer is mounted to the riser back, by screwing it into a threaded accessory hole located just below the grip on your bow. Nearly all compound and Olympic recurve bows come from the factory with this accessory hole in place. Stabilizers perform a variety of functions. They absorb vibrations in the bow at the shot, which reduces the shock felt in your hand on the bow grip, and makes the bow quieter. They help keep the bow balanced, by adding weight below the grip. That weight down low encourages the bow to stand up straight, which is critical for consistent accuracy. It also helps settle your sight as you aim at the target. Stabilizers combat bow torque. When an archer releases the bowstring, the riser torques as all that energy hits it. But a stabilizer, which adds weight out in front of the bow, resists that torque. We're growing fast. We now have our own online store up and running, but you can still find our stabilizer weights on our ebay store.